Heartburn is a painful burning sensation felt just above the stomach or in the lower chest due to reflux of stomach contents including gastric acids in the esophagus. This reflux occurs because the lower oesophageal sphincter (LES) which guards the stomach entrance opens up and allows the acid to flow backward. There can be many possible reasons for this phenomenon, the most common ones being high fat and spicy diet, lack of exercise, obesity and poor lifestyle. Every person experiences heartburn at least once during the lifetime but ignoring it can lead to its chronic form known as Gastro-Oesophageal Reflux Disease (GERD). In traditional heartburn home remedies, almonds are considered good for immediate relief from the burning sensations caused due to preliminary low-level heartburns. Some scientific data also supports the use of almonds to treat acid refluxes. However, there is a considerable amount of data available that negates the use of almonds for heartburn therapy because of its high fat and oil content. In clinical studies, almonds have been proven to provide immediate relief for many patients but on the other hand, they served to exacerbate refluxes in some subjects, especially pregnant women. Therefore there has been a report of variable effect of almonds on different people, suggesting difference in toleration level of these nuts and the method of their consumption. There has not been enough research on exactly how almonds benefit or worsen heartburns, except a few assumptions based on the basic nature of almonds and its general effect on the gastrointestinal tract. By their oily character, a handful of almonds can sometimes settle down acid reflux in some people. Almonds contain the enzyme emulsion which acts on a glycoside amygdalin and breaks it down into glucose, thus speeding up the digestion, which could be the reason why almonds provide immediate relief in low levels of heartburn. Sweet almonds are known to be useful in peptic ulcer therapy. It is assumed that almonds heal the stomach wall by the virtue of their oil content and cure burns. This can be easily applied in case of heartburns too as heartburn is also caused by erosion of the stomach wall leading to burning sensation due to acids. Almonds skins are known to settle down the stomach and provide relief from indigestion and improve gut health. They reduce the gastric acidity as they have a pre-biotic skin and this, in turn, relieves heartburn. Since almonds are high in fat content, they are not sometimes not advised during pregnancy as they can significantly exacerbate acid refluxes which are already high during gestation. Fats take a lot of time for digestion which puts pressure on the LES and causes refluxes. Almonds don’t suit everyone’s gut and thus, can cause allergic reactions that include exacerbation of heartburns and acid refluxes. Almonds don’t tend to be beneficial to all and on the whole. There can be different types of almonds or different consumption strategies which can have variable effects. For instance, only sweet almonds and not bitter almonds are known to alleviate heartburns in some people in contrast to those who experience the therapeutic effects of both sweet and bitter almonds. Dried almonds and almond milk provide relief from indigestion and heartburn caused due to it. Almond skin as mentioned earlier can act as an amazing pre-biotic which improves the growth of friendly bacteria in the gut and thus improves digestion and minimizes acid refluxes. Many times, it is recommended to soak and peel the almond before consumption. That increases the water content of the almonds and lowers the oil content which can be tolerable to people who cannot consume raw dried almonds due to high-fat content. Another contrasting study, however, indicates that soaking almonds however might not be as good for digestion as roasted almonds are. Roasted almonds have minimal water content and their skins shrink due to the loss of water. This causes easy penetration of the gastric juices through the nut and easier and faster digestion which can alleviate heartburns. What so ever is the case, almonds can always be consumed raw because either soaking or roasting changes its nutritional value. Also, it can be a personal choice according to what is suitable for the gut, whether the almonds should be consumed soaked or roasted. As indicated previously, almonds are high in oil and fat content and precautions should be taken while consumption. No more than 6-8 nuts should be consumed at a time per day as they may worsen the acid refluxes instead of helping in it. Also, heart patients and ones with fluctuation blood pressure should consult the doctor before consuming almonds. Some people might be allergic to the skin and not the kernel of the nut, which increases the responsive IgE antibody in their body upon exposure. Those people should necessarily consume soaked and peeled almonds rather than eating the whole raw almonds. 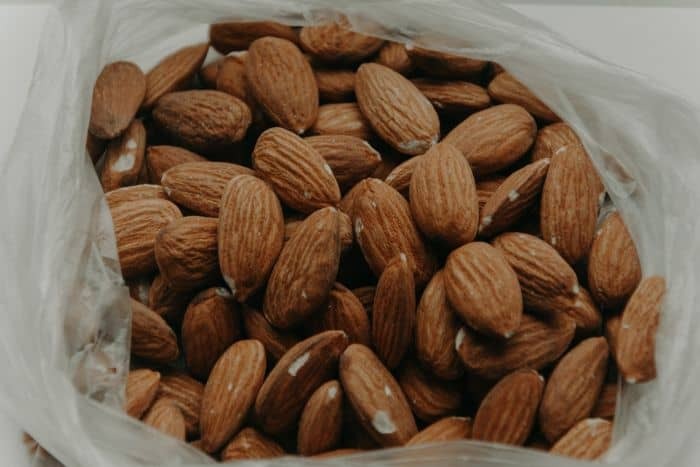 Almonds are a debated food item to be consumed during heartburns as; when in most cases it is advised to take a handful of nuts for quick relief, some people find them aggravating the effects of acid refluxes. Harmful or beneficial, the effects of almonds also depend upon their dose and the way of consumption. In general, the beneficial effects, nevertheless, exceed the harmful effects and can be considered safe for consumption to maintain a healthy gut.